A giant blaze of flames erupted around 9:30 p.m. local time at one of Dubai's luxury downtown hotels. Although some details of the fire — such as the cause behind it — have yet to be determined, officials did confirm that there were several injuries at The Address hotel fire in Dubai. According to Al Jazeera, though, one person died after suffering a heart attack during the commotion. However, the Dubai police chief has denied that report. The other injuries consisted of 14 minor injuries and one moderate injury that were due to smoke inhalation and overcrowding at the site of the fire. The location of the fire was a luxury hotel and apartment building called The Address. The structure is 63 stories tall, and was completely booked for New Year's Eve. Witnesses in the building said they were evacuated after the fire began. Although the cause of the fire is not yet known, there is no indication to suspect it was any form of terrorist attack. 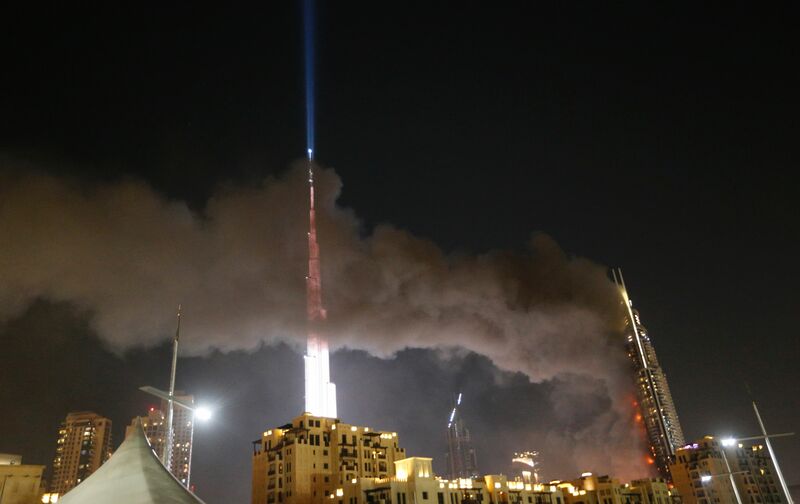 The Dubai Media Office said the fire originated on the outside of the building near the 20th floor. The blaze started before a fireworks display to ring in the New Year was set to start, and despite the fire raging nearby, the celebrations went on as planned.